Why should I get an overdenture? 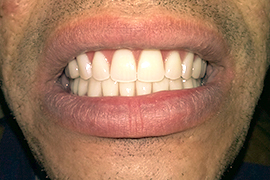 Am I a good candidate for overdentures? How much does an overdenture cost? What shall I do after getting my overdentures? A removable denture anchored by dental implants is called an overdenture and it is designed to permanently replace missing teeth for a completely toothless jaw. This type of removable restoration is retained by a bar/ locator or balls that are anchored to typically 2 or 4 dental implants. It is mainly intended for those who seek an affordable alternative to dental implant supported, fixed full bridge restoration or if there is a medical reason that impede the placement of multiple implants. Overdentures are firmly attached to the implants, so they are strong and stable and provide a safe and comfortable alternative to traditional removable dentures. In addition, they are reduced in size for maximum comfort for your everyday life. Most people who have conventional full or partial dentures don’t wear them for a very simple fact, which is that they tend to move out of their place from time to time. If you have encountered the same problem, you may already know the embarrassment of slipping dentures, not being able to eat the foods that you like and the inconviniences and ineffectiveness of denture adhesives. Tooth replacement options retained by dental implants, however, offer a stable way to keep false teeth in place and allow you to live your daily life with confidence. Not to mention that they may also promote additional health benefits. When in place, your overdentures will not detach, you can safely eat, speak and smile during the day and you’ll only have to remove them for cleaning. Patient started his dental treatment at our clinic with all his teeth missing and had 4 dental implants placed in his upper jawbone and 2 in the lower one. 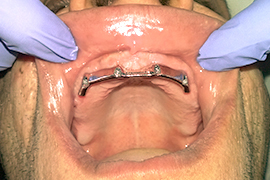 Following the necessary healing period, an overdenture with a retention bar was prepared to cover the upper front and molar region, while a locator supported overdenture was placed on the lower jawbone. Most healthy individuals who are firmly committed to good oral hygiene are suitable candidates for dental implantation and consequently for the preparation of overdentures. Before undergoing the treatment, however, you may want to consider your general health conditions and everyday habits. It is also essential to have an adequate amount of jawbone that properly supports the dental implants and provides long-term stability for the overdentures. Your bone mass can be assessed based on the combination of a dental panoramic X-ray and a CT scan that shows a 3D view of the volume of the jawbone and allows the dentist to decide if there is need for bone grafting and sinus lift. However, there are certain contraindications that may increase the risk of failure in the placement of dental implants and therefore the eventual functioning of the overdenture. For example, active periodontal disease, heavy smoking and grinding of the teeth need to be treated or suspended prior to the dental treatment. There are plenty of tooth replacement options, therefore every case can be dealt with in a number of ways to provide you with the most suitable solution. 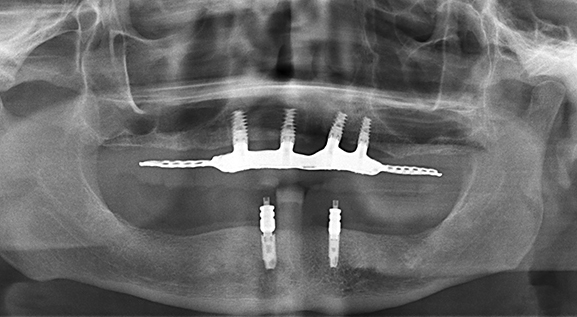 If you have no teeth in the lower jaw and are not eligible for multiple implant placements from a medical point of view, you may consider an overdenture placed on 2 implants, instead of a conventional completely removable denture. The same overdenture concept for the treatment of the upper jaw, will usually require more implants (4-6) as the bone is generally softer. 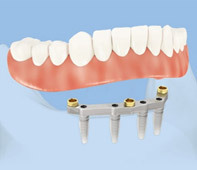 Once in the mouth, the implants make the overdentures much more stable and reliable than traditional full or partial dentures. There are two main stages of the overdenture treatment that is generally needed for all of our patients. The first stage involves the extractions if necessary and the placement of the implants into your jawbone (depends on the position of the existing teeth, in some cases we have to do it in two visits). 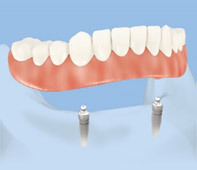 The implant is then left to heal for a period of 4 months, during which time the implant becomes fused to the bone. Following the appropriate healing period, the implant will be fitted with a healing cap for soft tissue contouring. Upon this visit, impressions will be taken and sent to the dental lab where your overdenture will be created. Following several try-in appointments, your overdenture will be fitted and you’ll be given instructions on how to properly maintain them. Although overdentures provide a stable solution compared to traditional full and partial dentures when it comes to chewing, they must also be removed for cleaning purposes. In order to maintain a healthy surrounding gum for the dental implants, it is absolutely necessary to clean the implants and the overdenture regularly. Since it is held in place in your mouth with a bar retained by dental implants, it is easily removable by clipping it on and off the bar. Cleaning means taking the overdentures out on a daily basis to be able to brush and floss the implant abutments, to rinse your mouth and soak the overdentures.